Atopic eczema or dermatitis is a very common and chronic skin disorder affecting almost a third of Australians at some point in their life. It most commonly first appears in young children and babies, and in many cases children “grow out of” eczema by school age. However for some people it can persist into adulthood. It is not possible to predict who will have the condition long term. Even from a young age, eczema can have a significant impact on patients and their families, affecting sleep, daily activities, school and work attendance, not to mention the expense of hospitalisation and medical treatments. The inflamed, itchy, often infected skin becomes a burden for many families and frustration at not being able to control the condition leads to desperation for many involved. While the exact cause of eczema is not clearly understood, it is most likely that there are several factors contributing to the disease. 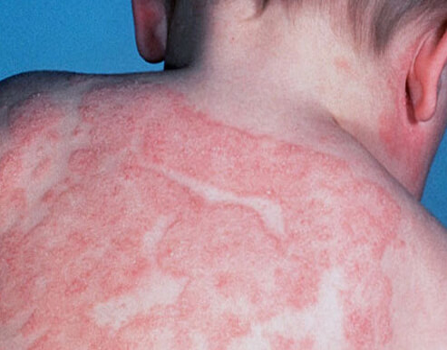 It is most common in families with a history of eczema, hayfever and sinusitis, and asthma. But there is substantial evidence that this is due to a genetically determined defective barrier function in the skin, which leads to dry skin and increased sensitivity to irritants and allergens. It is also understood that there may be an exaggerated response to allergens by the immune system in people with atopic eczema, leading to irritation, itch, stinging and redness of the skin. Many people with chronic eczema carry more bacteria such as staphylococcus on their skin. Bacteria can act as an “allergen” and contribute to unstable eczema and lead to more frequent and difficult to control skin infections. Many external factors such as hot or dry weather, clothing, stress, plants, and dust and dust mites can also play a major role in how eczema affects some patients. Visit eczema.org.au website for some helpful resources relating to eczema. Often treatments such as avoiding soaps and selecting the right moisturisers can be very simple yet very effective. Treatments do not have to be expensive. Phototherapy (ultraviolet light therapy) is often effective for a large proportion of patients and is bulk-billed at Central Dermatology Clinic, so the only cost to the patient is their time. New treatments targeting specific molecules of your immune system become gradually available. Talk to your dermatologist to get a sensible, tailored and effective treatment plan for you or your family member’s eczema. It is a much easier road to follow when your dermatologist is with you along the way.